Do you remember your table manners? 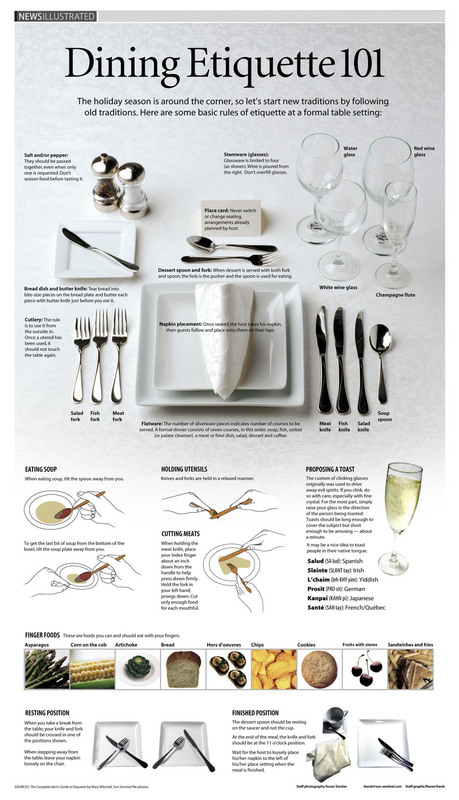 In case you need a reminder just in time for the holidays, here's a handy inforgraph from Visual.ly to help you have impeccable dining etiquette. This infograph not only answers common cutlery questions, it also offers advice on proposing a toast and which foods are acceptable to eat with your fingers. Did you asparagus counts as a finger food? Keep reading to learn all your table manners in less than 5 minutes. For more help eating difficult foods, you can turn to FDL's exclusive video lessons for eating tricky foods like sushi and spaghetti.